The original kick-off to the Navajo Nation’s Just Move It (JMI) campaign, which runs each year between May and July, dates back to 1993. This year, July 28th will mark the final event for the 2016 season, and Partnership With Native Americans (PWNA) wants to extend our hearty compliments for another year of Just Move It. What began in just 20 communities with fewer than 500 participants has grown exponentially to a whopping 40,000 people in 137 communities across the Navajo Nation. 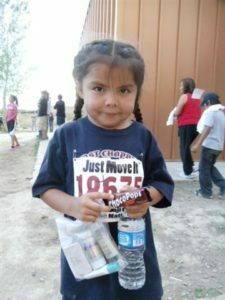 Movement is really the only way to describe the Just Move It program, which was established to combat health disparities that are facing Navajo and other indigenous communities daily. According to the Center for Disease Control, heart disease is the leading cause of death among American Indian/Alaska Natives and diabetes ranks fifth in the same listing. Obesity is not only impacting our adult population, but Native youth are also at risk at an alarming rate. Community efforts are necessary to effectively combat these inequities. PWNA has been fortunate enough to support events such as Just Move It for many years, and this year we are providing incentives and supplies for more than 2,000 participants through 11 Program Partners in Arizona and New Mexico. Three tons of supplies have gone out – reaching all five agencies of the Navajo Nation. PWNA tribal partners use our supplies to help participants stay hydrated and protected in the summer heat. Water, sunscreen and lip balm are just a few examples of necessities that help those attending the Just Move It community events. My own experience with JMI was hosted at the Red Rock Chapter near Gallup, New Mexico, several years ago. Community members of all ages were arriving to run or walk the designated path towards better health. Although the event is non-competitive, many participants came prepared to run – setting a faster pace for those wishing to challenge their cardio levels. Elders, children and families with babies in strollers were all encouraging one another, smiling and visiting as they walked. Many sported their JMI t-shirts and I even earned one for participating. Staff from the Indian Health Service (I.H.S.) and the Community Health Representative program were on hand to educate and provide important screenings for blood pressure and blood sugar levels, keeping their community members informed. This entry was posted in Humanitarian, Programs and tagged diabetes, Fitness, health, Just Move It, Native American, Navajo, obesity. Bookmark the permalink. Trackbacks are closed, but you can post a comment.